Hello Tokyo - Ikebana Experience- Japanese traditional floral art Let's touch authentic Japan! Will create a fundamental traditional flower style of Sogetsu school with a gentle guide of a professional teacher. Face to flowers, talk to flowers and talk to yourself in a authentic Tatami room. The place is a Ryokan( Japanese Inn) that has 60 years history and you can enjoy the beautiful retro architecture as well as Ikebana. After your creative time, you will enjoy a cup of green tea and Japanese confection together and appreciate your work. After Ikebana experience, a staff of Ryokan will show you a beautiful architecture and you can enjoy a mini-tour of Ryokan. Let's take a beautiful photo in like a movie settings. Welcome you at a beautiful Ryokan( Japanese Inn) that has 60 years history located in Hongo, the educational area in Tokyo city and near to Tokyo University. You take off your shoes and relax yourself in a Japanese traditional tatami room with the smell of straw mats. 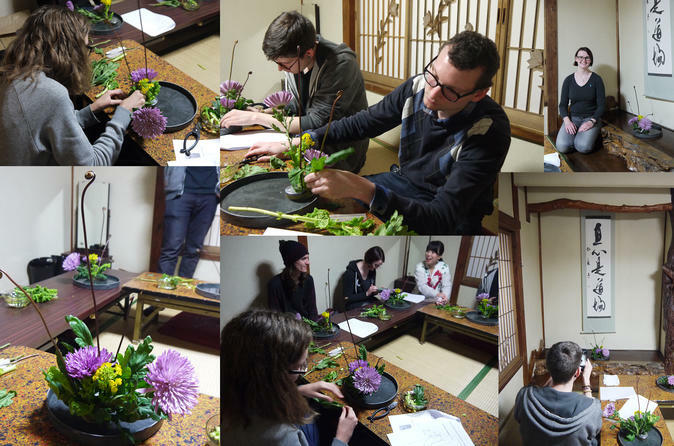 You will learn how to use a special Ikebana scissors and how to fix flower materials with Kenzan (a needle-pin sholder), then create the fundamental Ikebana style (Basic Upright Style of Sogegtsu School) after a teacher's demonstration how to create. You will talk to flowers and talk to yourself in comfortable tranquility and feel and touch the new sense of beauty Ikebana has. You will understand the sense of space and the meaning of Ikebana with creating your art work. After arranging Ikebana, you will enjoy a cup of green tea and Japanese confection together with your teacher and appreciate your work. The place where we enjoy Ikebana is a beautiful traditional Inn. The style of architecture is old and unique that is precious in modern Tokyo. There are so many attractive points you can never skip. After Ikebana experience, a staff of Ryokan will show you a beautiful architecture and you can enjoy a mini-tour of Ryokan. Let's take a beautiful photo in like a movie settings. You dip yourself in the old-time wooden culture. This course is led by an professional teacher who has learned Ikebana for many years and have a formal diploma of a teacher of Ikebana. All guide will conducted in English only.